What Are Cumulus Clouds Made Up Of? 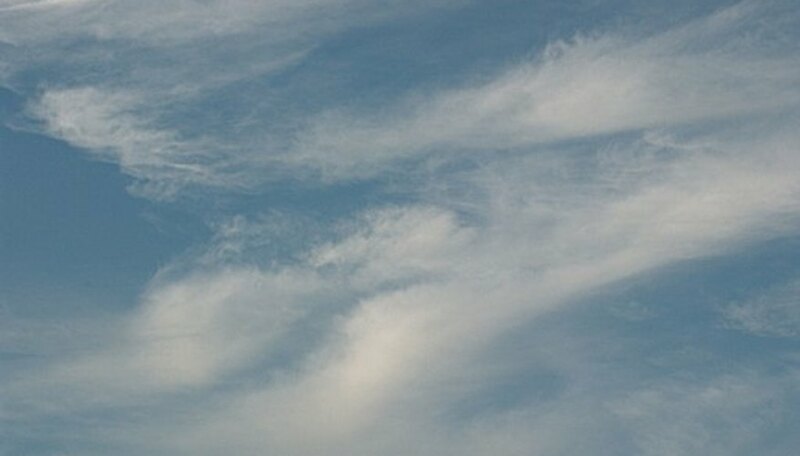 Cirrostratus clouds start as feathery mares' tails that may grow and layer into thin sheet-like clouds. Besides foretelling a possible change in the weather, cirrostratus clouds may reflect the light from the sun or moon, creating colorful and sometimes eerie effects. These fascinating clouds occur high in the troposphere, where water molecules freeze into ice crystals. Clouds are defined by elevation, shape and texture. Cloud elevations are identified as high-level cirrus (above 20,000 feet), mid-level alto (between 6,500 and 20,000) and low-level (below 6,500) clouds. The shape or texture of clouds are stratus (sheets or layers) and cumulus (heap). Nimbus, another meteorological term, means rain cloud. Combining these terms identifies different types and elevations of clouds. Cirrus clouds are high clouds. Cirrostratus literally means high (cirro-, from cirrus) sheet-like or layered (stratus) clouds. Cirrus clouds form the so-called mares' tails clouds high in the atmosphere. These feathery, delicate-looking clouds appear above other cloud formations. As more moisture condenses and freezes, the cirrus feathers may begin to coalesce into thicker clouds. Cirrostratus occur when the mares' tails grow and overlap to become a sheet of high, thin clouds. Cirrostratus clouds remain thin enough for sunlight to shine through and shadows to be seen. If the clouds thicken more, their heavier mass causes them to move down in the atmosphere to become altostratus. Most clouds occur when water vapor, the gaseous form of water, condenses in sufficient quantities to be seen. Clouds, except for some thunderstorms, occur in the troposphere, the lowest layer of the atmosphere. Cirrus clouds develop above 20,000 feet, near the top of the troposphere. At this elevation, water vapor freezes into ice crystals. Only the tops of cumulonimbus (better known as thunderstorms, thunderheads or thunder clouds) rise higher than cirrostratus, reaching up to 50,000 feet or more above sea level. Cirrostratus clouds often form when a warm front, a mass of warmer air, moves up and over colder air. The warmer air holds more water vapor than the colder air. As the warmer air rises, however, the air cools and the water vapor begins to condense, forming cloud masses including cumulus, or puffy cottonball-type clouds, and stratus, or sheet-like clouds. The higher the warm air flows, the more likely that cirrus clouds will form. When enough cirrus clouds form and overlap, the cirrus clouds form the stratus or sheets of cirrostratus clouds. Cirrus clouds also may form in low-pressure systems when air is forced upward at the center of the system. If the air reaches high enough to form ice crystals, cirrus may form. Cirrus may also appear at and around thunderstorms as upper level winds blow ice crystals off the top of these towering cumulonimbus clouds. Jet streaks may cause the formation of cirrus clouds. Jet streaks consist of faster-moving air within the jet stream, similar to rapids in a river. These jet streaks mark areas of turbulence in the atmosphere. Weather forecasters evaluate these jet streaks for potential changes in weather. Pilots use the cirrus clouds developed by jet streaks as warning signs of turbulence. The ice crystals forming cirrostratus clouds occur as small (about 10 micrometer) hexagonal crystals. When sunlight shines through a thin sheet of cirrostratus clouds, a ring or halo may appear around the sun. A similar effect sometimes occurs when sunlight reflects off the moon and through cirrostratus clouds. The light refracts off the ice crystals in the cirrostratus cloud, creating the effect of a ring. Weather folklore says the ring means that rain is coming, and the closer the ring is to the sun or moon, the sooner the rain will arrive. While folklore may not always be reliable, cirrostratus clouds do indicate a possible change in weather. Another unusual effect from cirrostratus clouds are sundogs. When the ice crystals in cirrostratus clouds uniformly align, sunlight reflection may create a rainbow effect on opposite sides of the sun. A similar but rare phenomenon may happen when the sun is low on the horizon. If the ice crystals in the cirrostratus are uniformly aligned, a sunpillar may appear. A sunpillar appears to be a pillar or shaft of light extending above and below the sun. G, Karen. "Facts on Cirrostratus Clouds." Sciencing, https://sciencing.com/cirrostratus-clouds-8586249.html. 20 July 2018.